In 1066 William the Conqueror gave the land in the Wold Newton area to his nephew Gilbert de Grant. He founded All Saints’ Church, Hunmanby, and later built ten Chapels of Ease, also called daughter churches. All Saints’, Wold Newton, was one of these, and is thought to have been completed around the year 1100. The church is a Grade II* listed stone building, incorporating a nave, chancel, south porch and west bell turret containing original Norman masonry. A north aisle, designed by Temple Moore, a noted ecclesiastical architect of his day, was added in the middle of the 19th century. 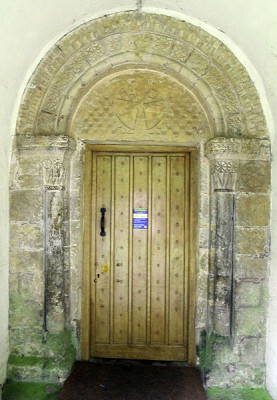 There is a Priest’s doorway in the south wall of the Chancel, also known as the Lepers’ door, where those stricken with the disease could worship outside the church, with a view of the altar. There is also a Norman round headed slit window high up in the south Nave wall, near the east end. 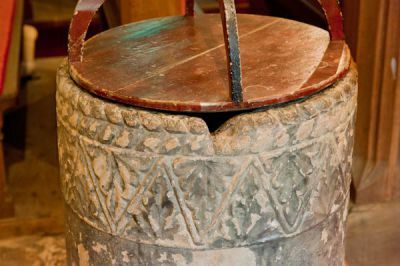 The remarkable circular patterned font is also Norman. ​For more information about the Church building, click on the Church Building and Church Information buttosn below. For listing information click on the listing information button. ​​On 13th December, 1795 a 56 pound meteorite, the second largest recorded in England, landed about half a mile north of Wold Newton village, in a field near The Wold Cottage, at the time the home of a magistrate named Mr Edward Topham. Fortunately, the meteorite's passage and impact were observed and the statements of witnesses were taken on oath by Mr Topham. The loud explosion "alarmed the surrounding country and created so distinctly the sensation that something very singular had happened". That sensation was strongest of all for Mr Topham's shepherd, one John Shipley, who was within 150 yards of the spot and who was struck very forcibly by mud and earth as the meteorite plunged into the ground. In order to continue to maintain its mission of being a focal point for Christian worship and work in our community, and also to enhance the use of the Church for other community uses, we are embarking an ambitious project to ehance the facilities in the church, which requires the following work to be put in place. We continue to make progress on this project in conjunction with the Church Architect and Diocesan Buildings Officer. Final plans are now available, and consultations with prospective builders are ongoing. The next stages include obtaining the necessary Building Regulation approvals, English Heritage archaeological search, fundraising and Dioicesan approval. Watch this space to see how the project moves forward.